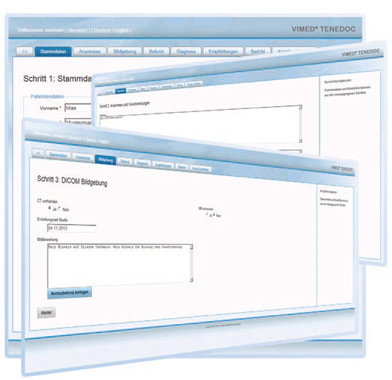 The VIMED® TENEDOC is a server-based software providing a unified and standardized form of documentation for participating partners and telemedicine centers. A high degree of data security is ensured thanks to the combination of the network-standard VPN-encryption and the encrypted connection between browser and server. System access is provided via a personalized password-secured account for all participants. VIMED® TENEDOC is also adapted for operating via mobile devices with touch screen. The doctor receives with VIMED® TENEDOC, a software solution for the intelligent processing and documentation of medical data relating to the treatment of neurological patients. The generated data is finally available for the cooperating clinics in text form and they can be printed automatically.